I do enjoy the occasional lawn raking and sweeping. There’s something deep about the colored leaves that fall in autumn. It’s a good time to think and meditate on roses and poor life choices. Most of the time, though, it’s a chore and I don’t even have that big a garden! Besides, we really should remove fallen leaves from our lawns as they keep sunlight from reaching the grass. Regular raking can also damage your precious lawn if you’re not careful, or too deep in thought. I’ve never liked leaf blowers because of the noise and pollution they emit. So, I decided on a lawn sweeper. Of course I had to get the best lawn sweeper I could find. Read more When To Apply Lime To Lawn? Like that time I looked for a good mower, the number of lawn sweeper choices was incredible! I saw different kinds at different price points with different features, and it was confusing! I had no idea where to start! After much research and testing, I finally got the perfect lawn sweeper on the budget I had. You don’t have to go through the same frustration as I did! I’ll be sharing with you here everything I’ve learned on my quest for the best lawn sweeper! There you go! That’s ten different lawn sweepers, five walk-behind lawn sweepers and five tow sweepers. Initially I didn’t know whether to get a walk-behind or a tow attachment. They seemed equally effective to the task. I had just about had enough of the constant raking and manual sweeping of the leaves and grass clippings that I’d found on my otherwise clean cut grass. I considered my budget and the size of my lawn. I have an average-sized lawn and had about $300 to spare. I listed nine sweepers within the money I had but also added a gasoline-powered push sweeper (the Troy-Bilt) just because it got me curious. One look at its price and weight, though, and I knew I wouldn’t be getting it. Again, I’m partial to noisy and air-polluting (and expensive) machines so I wouldn’t suggest you get one. Feel free to check it out if you have an abundance of gasoline and haven’t swept your lawn in a year or so. Although, you may also consider the size of the sweepers and the bag, or hopper that comes with it. In addition to being effective in its intended use, which is to sweep up leaves, clippings, loose dirt, and other lawn debris, a good lawn sweeper must be durable. It will face a lot of wear and tear as it pulls debris so a sturdy body and hopper bag is a must. I also found the most if not all of the lawn sweepers require some assembly before use and different techniques for the best cut. Hence user-friendliness is also essential. The Agri-Fab 45-0218 is our winner for the best lawn sweeper in the Push class! This durable sweeper is incredibly light but has one of the biggest hopper bags in its class so bigger lawns will not be a problem. Being very affordable didn’t hurt too. The hopper also proved quite sturdy as opposed to some of the other lawn sweepers that easily wore out, or sadly, tore completely. I also appreciated being able to collapse the hopper for easy storage or even hang it up because it’s so light! If you’re on a budget and not in possession of a tractor or ATV, then this lawn sweeper would be best for you. I eventually bought this particular lawn sweeper and I can say I’m satisfied. I can now go back to my meditating with worrying about damaging my grass with a rake. Another great lawn sweeper from Agri-Fab! I would have chosen this lawn sweeper if my lawn was any bigger! So I’ve you have a larger property and you’re looking for a great attachment to your riding lawn mower, tractor or garden ATV, look no further than the Agri-Fab 45-0492. It’s 42-inch sweepers and large hopper size makes quick work of any messy lawn. Like its smaller cousin in the push class, this lawn sweeper is very sturdy and stores very nicely in your garage or garden shed. You’ll be able to save more time as its patented hitch allows for simultaneous mowing and sweeping! A very nifty feature, as well, is the level that juts out from the middle of the sweeper which allows you to empty the hopper without even getting off your mower! This tow-sweeper is hungry for all those fallen leaves and pine cones! Those are our best lawn sweepers in their respective classes. Continue reading below about the other eight lawn sweepers or you can skip to our lawn sweeper guide for more information. There are two classes of lawn sweepers: Push sweepers and tow sweepers. Push sweepers can look like your regular walk-behind mower but instead of cutting grass, it sweeps up leaves and lawn debris with brushes using the momentum from the forward movement. The brushes sweep the debris into a large hopper bag for easy disposal. Push Sweepers are a good fit for smaller properties that need weekly maintenance. These however can become inefficient on slopes or large properties. Most push sweepers handle wet debris poorly. Tow sweepers, on the other hand, work by being hitched to the back of a riding mower, tractor or ATV and uses that momentum to brush leaves into its hopper bag. Tow sweepers are usually bigger than push sweepers and have higher capacity bags then push sweepers. They are great for bigger lawns or large swathes of land as they cover ground much faster due to their bigger sized sweepers. If you own (or maintain) a land larger than an acre, a tow sweeper would be best. Tow Sweepers are also more expensive than push sweepers and may be difficult to use in smaller areas. Do you remember all the benefits you gained when you switched from manual lawn trimming to using a mower? 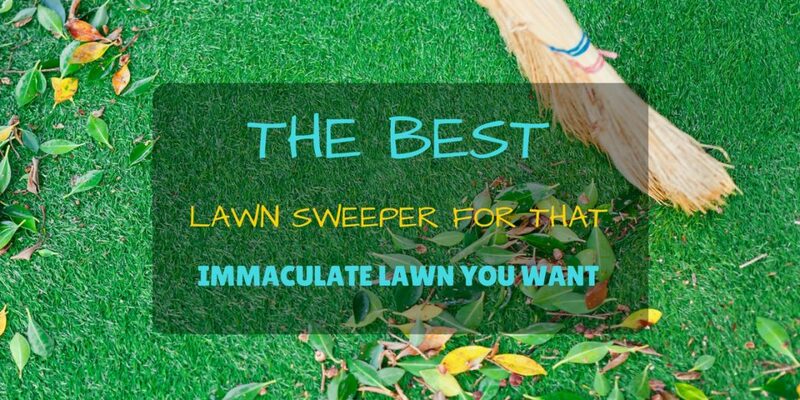 Making use of a good lawn sweeper will amplify those benefits! I hope this handy guide will be helpful to you! Save your time and your back and get a lawn sweeper!